In 1976 we decided to move to a larger house. The idea was to find a small theatre organ to install there along the lines of Wurlitzer Lodge in Northolt, the home of the late Les and Edith Rawle. We found a suitable instrument formerly installed in the Odeon, Wealdstone and Les assured us this was the one for us. As usual he was right and under his guidance we removed the Compton from a school in Harrow after concluding a very good deal and began transporting it to its new home. A large chamber was constructed on the side of the house with grilles to allow the sound into the massive lounge. After six months the organ was playing again. Fellow Midland enthusiasts started asking “will you be having concerts?”, so on Sunday, 9th May 1979 Les Rawle cut the ribbon and the famous John Mann presented the first Sunday Concert. These have continued to the present day. After working as a full-time musician since 1964 it was decided that, due to the popularity of the venue, we would open every day with formal concerts on Sunday afternoons and special shows for coach parties any afternoon or evening of the week. In 1984 a full licence was obtained for entertainment, together with a fully licensed bar and after a slow start we were in business, sometimes presenting two shows per day often seven days a week. Buffet style teas and suppers were offered, together with Dancing and Cabaret evenings. 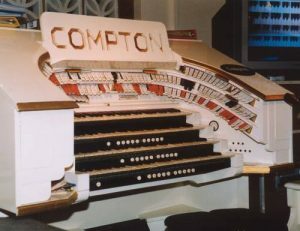 Compton Lodge soon became a unique venue on the organ scene. In the mid-nineties we decided to take life a little easier cutting down on group visits, closing the catering department! This was the chance to overhaul and enlarge the Compton. After obtaining a stock of pipes, chests, relays etc., we were lucky to be able to purchase the 4 manual console from the famous Ritz Belfast Compton. We developed a comprehensive specification on Wurlitzer lines with 20 Pipe Units, installed in two chambers. Musical shows and Film shows are presented throughout the year with resident Paul Kirner and popular guest artists. “Paul Kirner’s” Theatre Organ Collection – which initially will operate Paul Kirner’s Music Palace at Ynyshir in the Rhondda Valley South Wales, and in the future Compton Lodge (Sapcote) and the Folly Farm Wurlitzer.